This would be the last day of walking the intended route. Though I was determined to continue to the coast at Cape Finisterre. 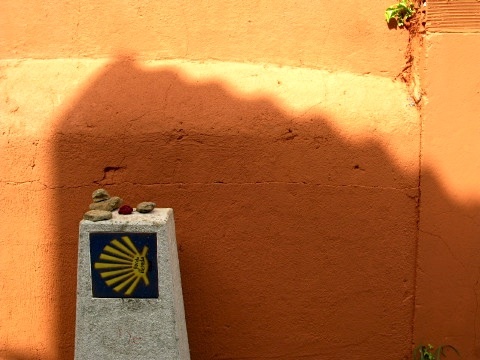 In Lectoure so many days ago I had laid my rucksack against a wall outside a supermarket. 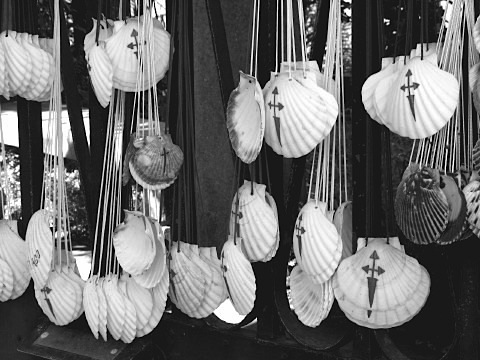 The scallop of Saint James on the rucksack had broken into three pieces. I had decided at that point that it was necessary to continue an additional three days to Finisterre to get another scallop shell. 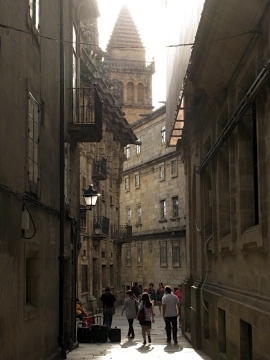 So even in Santiago de Compostela my walk would not be finished. Leaving Pedrouzo, the Way entered a deep thick woodland of eucalyptus and native trees. The Way climbed slowly through the thick wood with its magnificent tall trees. 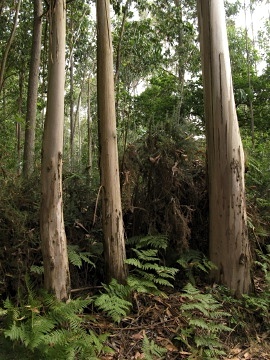 The eucalyptus had been planted many years ago in order to create a commercial forest. It looked as though they were not farmed any more. They had blended in with the surroundings. Near the top of the climb you could hear and see the jet planes taking off from Santiago airport. It had been some time since I had seen a plane and it was a re-introduction to the modern world. Distant and yet capable of much distance. So different from the pace of walking. Would I fit into the modern world again? Many pilgrims were happy as they walked. 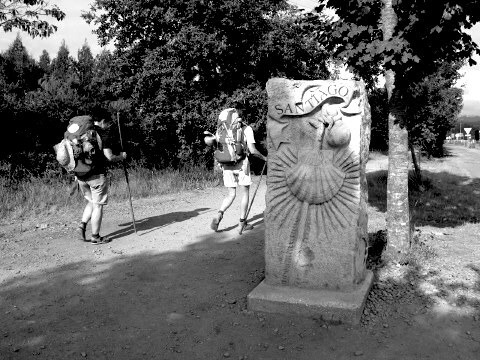 After all it was now only a few kilometres to Santiago de Compostela. For many it had been days if not weeks or even months of walking and the prospect of arriving was real and palpable. Everyone was in a good mood as the budget airlines whisked the former pilgrims back to their real world. In Santiago I would have to book my own flight back to the ‘real’ world. 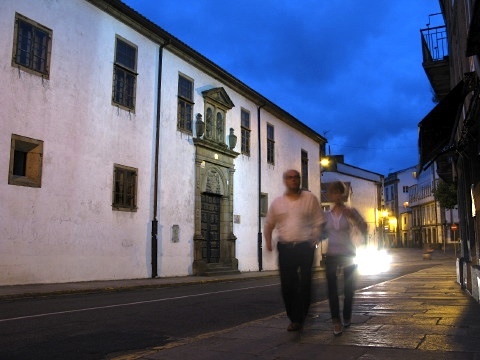 In Lavacolla there was an ancient washing place for pilgrims. Back to the past. By a river there was an area of paved and slabbed rock. In medieval times it was where pilgrims would have their final wash before arriving at the city. They would wash off all the dirt and grime from their pilgrimage. I knelt by the stream and followed the tradition of the past and washed myself as best I could. I, like thousands before me over the years, would arrive clean and refreshed at the Cathedral City. Not long after the small village of San Marcos appeared. There at the top of the village was a large monument, the Monte del Gozo. I ran into Roy and Matt again as I sat under a tree sheltering from the sun. With the view of Santiago de Compostela below me I could hardly imagine that I was there after so long on the Camino. I had feelings of complete tranquility at achieving what I set out to achieve. Groups of walkers and school groups were milling around the monument in preparation for their final few kilometres to the city. The view was magnificent looking down into the valley with the spires of the Cathedral soaring upwards in the afternoon sun. I felt light on my feet when I left Monte del Gozo. I was in a different world, everything was bright and light. Soon an intense feeling of tiredness overcame me. The feet were heavy, and the walking was laboured. 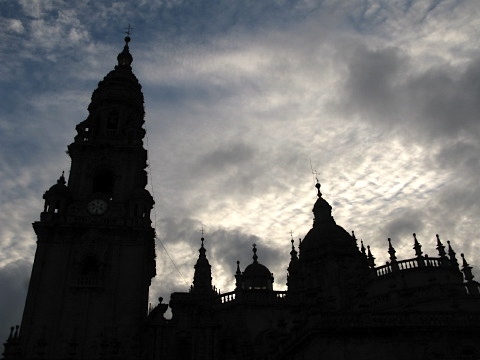 As I approached the centre of Santiago de Compostela, I reflected on the final five kilometres as being the most difficult of the whole Camino. The weight of something large lay upon me, I was thirsty and staggering a little when I arrived in Santiago. I could not explain the feeling any more clearly. It was immense and intense. It was the goal being realised after two months of walking. In town the feeling did not fade. It is a wonderful city. I met Deirdré again on entering the town and offered to pay back the €20 I had borrowed in O Cebreiro. She just said ‘later’. There were others from the Way. Rory and Matt were there as well as Daniel and Ricardo. I met up too with Eva and Hector, and Tunde and had a traditional meal of scallop with them at a great little restaurant. There was a pilgrim mass, as there is every day at the Cathedral at 7pm. I was so tired I could not go instead I found the Pilgrim Office and presented my Credential. The office was busy, musty and dark with old mahogany wall panels. There were quite a few questions asked and some deep scrutiny of my Credential. Where did I commence the walk? Did you stay in albergues and attend a mass? Are your reasons for the pilgrimage religious or for other reasons? Did you walk the whole way or did you take a bus at any point? Having passed the questioning, I finally obtained the Compostela. A protective cardboard tube (normally costing €1) was supplied for free as I had walked so far! That simple gesture seemed so significant! I met Rory and Matt again and we walked around looking for somewhere to stay. The pilgrim accommodation was in the sports centre some distance from the town centre and we did not want to venture that far. Finally Rory and Matt decided on a place and I returned to a small house that we had seen earlier. The landlady had been very welcoming and I was happy to stay there. Rory and Matt had been looking for somewhere a bit cheaper. I booked in for the night, and was happy that I would have my own single room after so many weeks of large snoring dormitories. 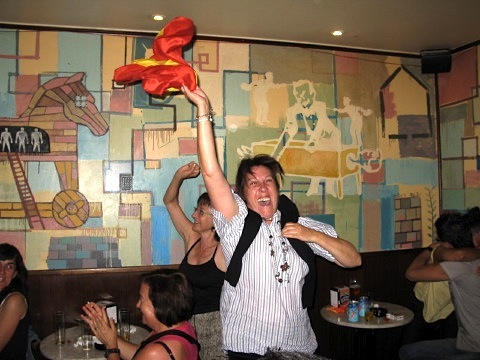 Wandering round town, I watched the World Cup final and was amazed and happy for Spain at the outcome. One lady in a photograph was equally amazed when they scored the winning goal! Later that night I basked in the warm feeling that overcame me as a result of finishing the Camino. I had never felt so happy and contented when I went to bed. Still, I thought about the three day walk to Cape Finisterre! There was always another goal in life. 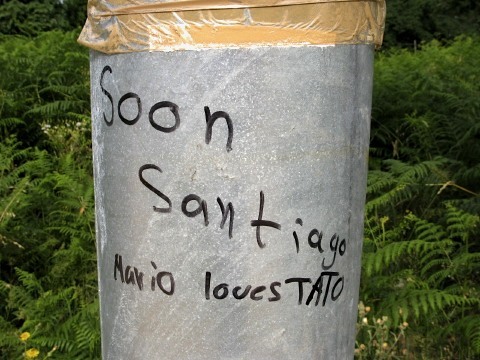 This entry was posted in From the Way and tagged Pedrouzo, Santiago de Compostela, Via Frances, Way of Saint James, Week Nine. Bookmark the permalink. Post a comment or leave a trackback: Trackback URL.